Mr. Gray and I travel by plane fairly frequently, and I’ve been flying since I was tiny. I couldn’t wait for Baby Gray to experience his first flight on our trip to Angel Fire. I don’t think watching him learn and experience new things will ever get old for me. I love to see that brain tick. He had some pretty good ideas formulated before we ever got to the airport (he had been in a helicopter before). We checked our bags, and he handled security like a champ. He explored the airport and watched all the planes coming and going until ours finally pulled up to our gate. He grabbed his boarding pass and headed down the jet way. He took that first step onto the plane, greeted the flight attendant and walked with us to get settled. “It’s just like the train!” he exclaimed. Why, yes. Yes it is. Why had we been using the helicopter as an analogy? Little brains, always working. He settled in and never missed a beat. Take off? No problem. Turbulence? No problem. (Lots of it? Still no problem.) Landing? No problem. It was like he’d been flying all his life. The best part of the whole flight was when he first noticed snow on the ground as we flew over the west Texas/Panhandle area. “SNOW!” he yelled louder than probably anyone else on the plane cared for. He was so excited, and we weren’t even there yet. The desert came back before we ever landed, but we took the time to do a little Walter White hunting since we were right outside the ol’ A-B-Q. We didn’t find him. 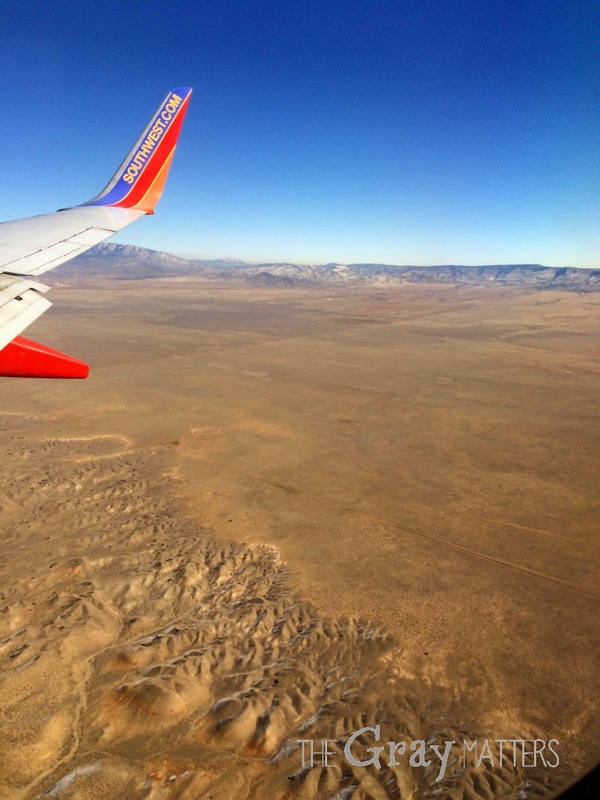 We did find all our luggage, our rental car, and our map–we were off to Angel Fire! Sounds fun! Glad he was a natural.